Thrift store jackpot! Well, a great deal, at least! I snagged this mirror at the thrift store for $2.99. Original TJMaxx sticker is marked 19.99. Great price, sort of zzzzz. Tape off the mirror. I also taped diagonal at the top right and bottom left mitered joints. Burnish the edges of the tape using thumbnail. Paint. I used a foam brush to apply two coats. 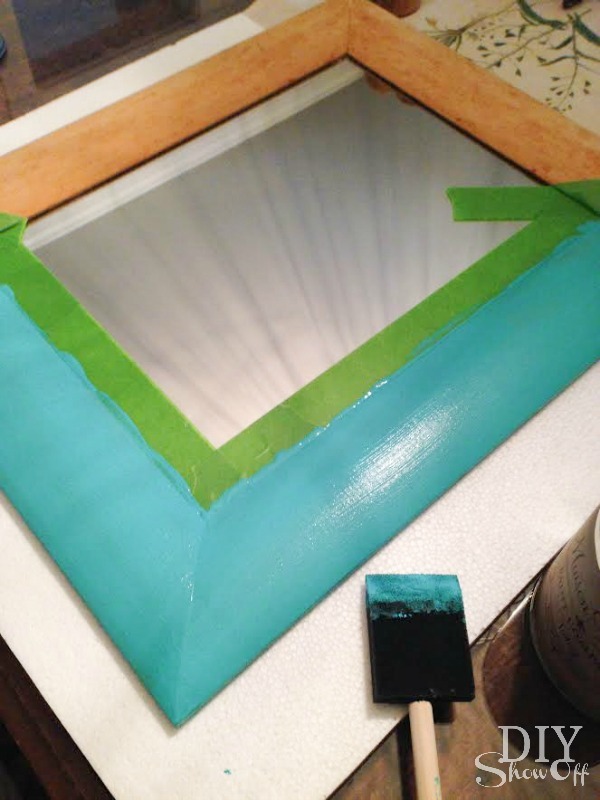 While paint is still wet, remove tape by pulling away from the paint. Let dry. Ready to hang and display. Sharing at Southern Hospitality Thrifty Treasures. Disclaimer: As a member of the FrogTape® Blog Squad, I received compensation to complete this project for using FrogTape® products. All opinions, projects and ideas are based on my own experience. 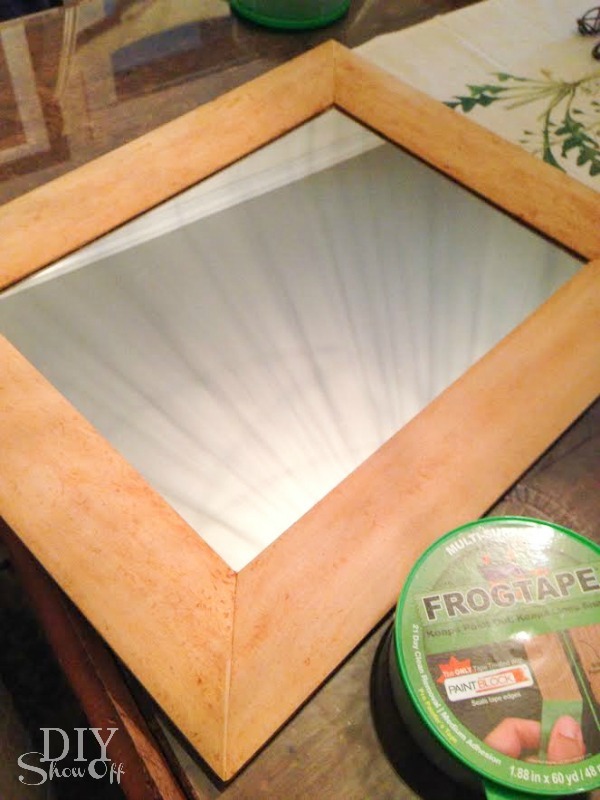 This entry was posted in Decorating, FrogTape, Home Accents, home decor, Roeshel's Projects, Thrifty Treasures and tagged DIY, flea market fip, FrogTape, makeover, mirror, Thrifty, Thrifty Treasures by Roeshel. Bookmark the permalink. great project! 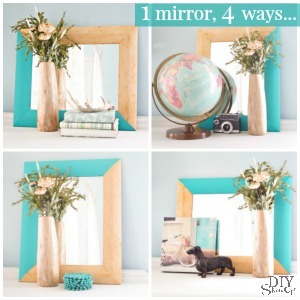 I have an old mirror that might look great with something like this…thanks for the inspiration! I love this idea, how fun. Love the turquoise too. Thrift Score! and such a Beauty now..Thanks for Sharing and I will be on the look out for a Mirror to try this out….also My Fave Color Too..Perfect. This is so cute! 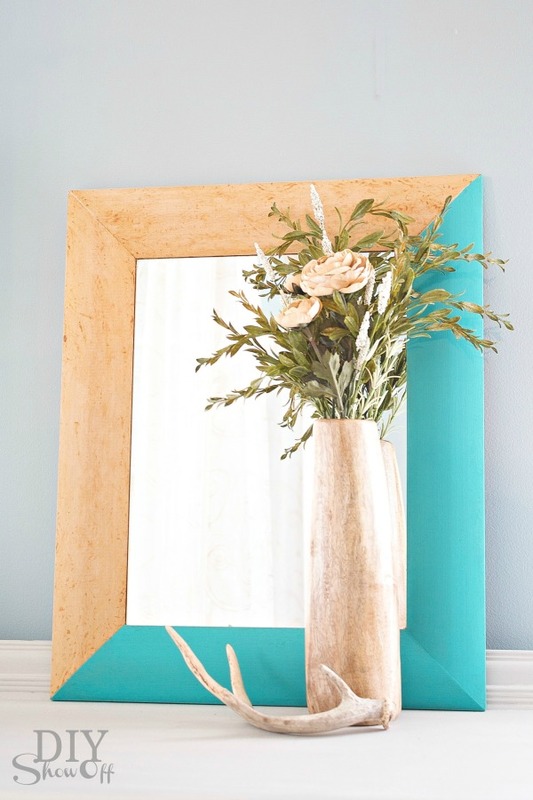 I would have never thought to paint half a frame to make it look super mod and cute! 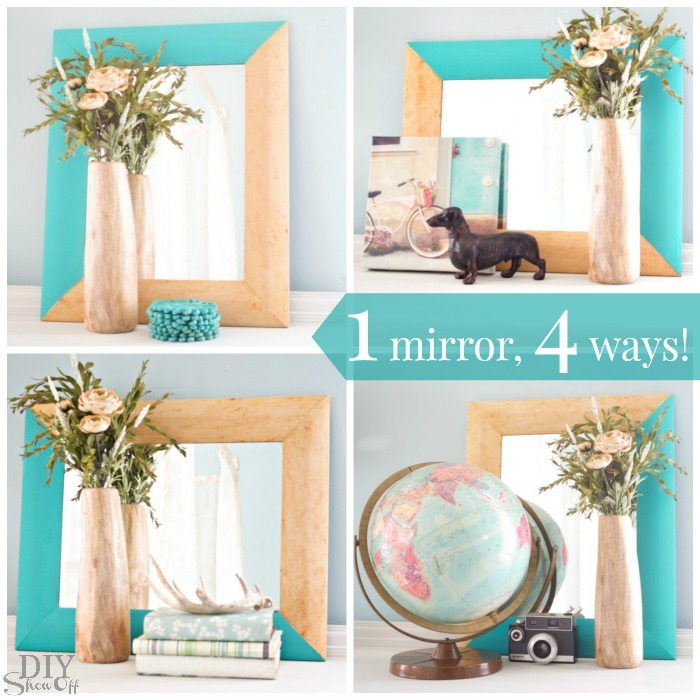 I love your mirror makeover! It is unique and classy! Thank you, for the inspiration! What an adorable idea! I looooooove to see what people do with their thrift store finds. Isn’t it so satisfying to take other people’s trash and turn it to treasure? I get such a thrill from it! Clever girl! I love the simplicity of it all! Thanks. 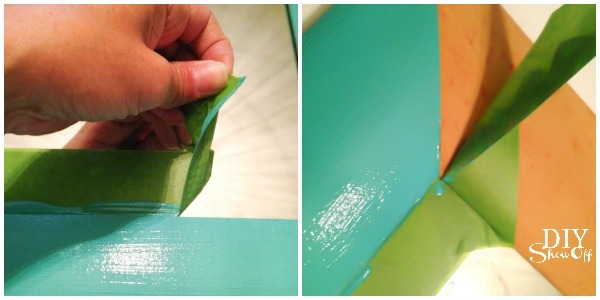 I use Frog Tape on almost every paint project I do. Fantastic product. Never checked out their website, but will do so now. So cute, and easy to boot. Oh, your mirror is so pretty! Oh that is so pretty Roeshel! What a fun idea, love the color! Great idea Roeshel! I love the color too! Gorgeous!! I love all of your vignettes and the ‘dipped’ look you created! 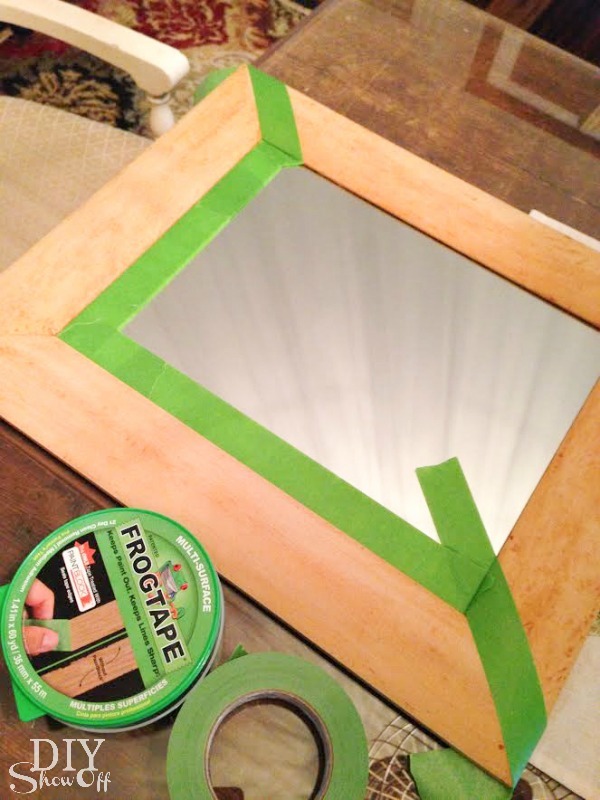 Love FrogTape! Such a creative and simple project! 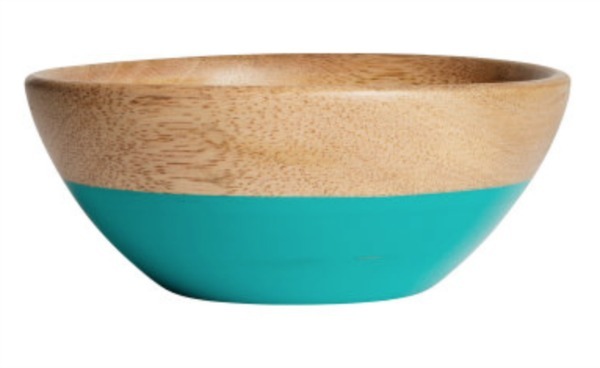 I’m totally a sucker for turquoise, too…. I just wanted to let you know that I included this project in a post today on my blog, Plaster & Disaster, about some inspirational projects from across the blogosphere that involve making over common thrift store items. It’s awesome to see creative ideas for transforming things that most people tend to pass right by. We link directly back to your original post, and ask people to pin from the original source. Thanks so much for the feature, Sage!